Robert McCammon » Robert R. McCammon's "On a Beautiful Summer's Day, He Was"
Robert R. McCammon's "On a Beautiful Summer's Day, He Was"
Eddie looked up from the work, grease all over the front of his sweat-soaked T-shirt, a smear of grease across his bulbous nose like black war paint. He nudged the guy next to him, Greg Cawthen, and then the third of them, Dennis Hafner, looked across the street and saw Junior, too. Junior knew what was coming. His feet in their bright blue Keds stuttered on the broken pavement, where bottle shards caught the summer sun. He was a tall boy for his age, but gaunt. His face was long, his chin pointed. His eyebrows merged over a thin, sharp nose. Know why your nose is in the middle of your face? his father had asked him once. Because it's the scenter. That's a joke, Junior. It's a joke. Get it? The corners of Junior's mouth upturned. His eyes were dark, and his cheeks strained. “Nowhere,” Junior answered, standing on shattered glass. “Gooney's too stupid to know where he's goin',” Dennis Hafner spoke up, from a mouth that looked like a puffy red wound. “Skinny little fruit.” His ugly lips spouted a sound of disgust. Junior squinted up at the sun. A bird was flying in the sky, alone in all that stark blue expanse. Junior shook his head. His heart was beating very hard, and he wished he had wings. Junior's mouth moved. “No,” he answered. He felt cold inside, as if his guts were coated with ice. “MOVE IT!” Eddie shouted, king of the block. Junior began walking again, in the same direction he'd been going, away from the house with the elm tree in its dried-up yard and paint peeling in strips from its front porch. His father's voice came to him, and he remembered his father sitting in front of the TV, scribbling on a yellow pad and saying this: Know what a nervous breakdown is, Junior? It's what happens when you spend half your time keeping your mind on your work and the other half keeping your work on your mind. That's a joke. Get it? Know what normal is, Junior? It's somebody before a shrink gets hold of him. He walked on, along the street layered with sunlight and shadows, his fingers grasping the bones in his pockets and his heart dark as a piece of coal. But he was smiling, on this beautiful summer day. Junior turned right at the next block. Ahead of him, shimmering in the heat, was the last remaining wooded hillside in this suburb. It was green and thick and held secrets. It was a wonderful place, and it was his destination. “Somewhere,” Junior said, and he kept walking toward the hillside. Wally was silent. The noise of his sneakers on the pavement said he was still following. Junior didn't want him to see the secret place. The secret place was his alone. “Go home, Wally,” Junior repeated. The beginning of the forest trail was coming up pretty soon. “I can if I want to!” Wally said, a note of petulance in his voice. Wally just stared at him, as the summer sun beat down on both of them. “Go find somebody else to bother,” Junior told him. Junior strode past him, and began walking alone again. Know what a friend is, Junior? It's somebody who has the same enemies as you. Junior waited for about ten minutes, there in the underbrush. When he was sure Wally wasn't coming after him, he stood up and continued on his way. The trail led through the last of the neighborhood's woods. Trash and bottles littered the ground, proof that others had followed this path, but Junior's secret place was up higher on the hillside and about a quarter of a mile away. The trail steepened and became a rough climb, and Junior had to struggle up by grasping onto tree roots that emerged from the dirt. He left the last of the trash and bottles behind, and climbed up through green woods. The secret place was well-hidden, and he'd only found it himself by accident, a couple of years before on one of his long solitary treks. At last, there it was. A rusted, brown water-tank that rose about sixty feet from the crest of the hill and was all but obscured by trees. A ladder led up, and Junior began to ascend with a quick, easy grace. The ladder took him to the top of the tank, where he stood up and looked to the northeast. 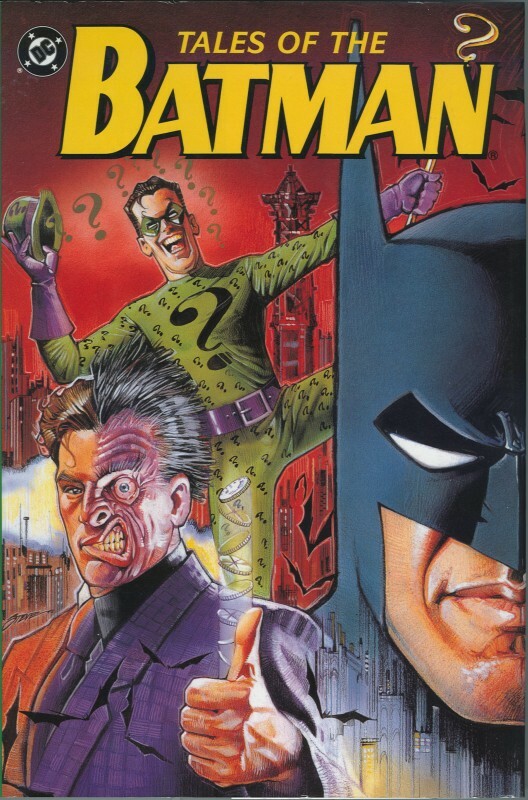 The gray towers of Gotham City loomed before him, and in the valley below were thousands of houses and buildings that radiated out from Gotham City on its maze of streets. There seemed to be nothing green in there, nothing but concrete and brick and stone. Factories stood between him and the central city, and the haze today was a pale, shimmering brown that clung close to the earth. One of those factories was the chemical company where his dad used to be a shift manager, last year, before his nervous breakdown. His dad still worked with the company, but now he was a salesman and he was on the road a lot. The factory was the one with the six tall chimneys, and today white streamers of smoke were rising from them into the brown air. Junior felt like the king of the world, looking down from this height. But he had the bones in his pockets, and there was work to be done. He went to the tank's hatch, where there was a flywheel. The flywheel had been tough to crack open. He'd had to bring a can of Rust-Eater—one of his dad's products—and a hammer, and even then it had been a hard task to loosen the wheel. Junior bent down and began to turn the wheel. It was still a tough job that he had to put his shoulders into. But the hatch was coming open, and in another moment he lifted it and looked down the hole. Another ladder led into the empty tank. Hot, dry air rose into Junior's face. He let most of the heat out, and then he eased down into the hole and began to descend the ladder, eagerness working in his brain like a hot little machine full of oiled gears. He was happy for a while, industrious amid his toys. He emerged when the afternoon had cooled. His pockets were empty. He resealed the water tank, went back the way he'd come through the woods, and headed for home. Eddie Connors and his buddies were no longer in sight, but the red Chevy was still there. Junior stopped at Mrs. Broughton's and leaned over her fence to smell a rose, and his gaze ticked back and forth, looking for Eddie or the others. A few beer cans lay on the street near the car. Junior stared at them, and began to shred the petals from a yellow rose. Then he crossed the street to the Chevy, took a handful of dirt and grit from the Connors' yard, and opened the Chevy's gas portal. In went the dirt, quick as you please. He washed it down with some beer left in a can, and then he closed the gas portal and returned the beer can exactly as it had been. And there he found his mother, on her knees in the front room, scrubbing the threadbare carpet around the easy chair that faced the television set. Two hours. Junior knew the routine. There was no time to be lost. He shoved down the terror that threatened to rise up within him, and he caged it. Then he hurried past his mother into his small dark room, and he began to straighten his shelves of books and put them all in alphabetical order. If there was one thing his father demanded, it was order in this chaotic world. Oh yes: and one other thing, too. “Yes, Mother,” he said, and he went into the kitchen where his mother was working on the yellow linoleum tiles that would never fully be clean, never, never in a hundred years of scrubbing, even with Stain-Away. At four minutes before six o'clock, they heard his car turn into the driveway. They heard the engine stop, and the driver's door open. They heard him coming, and mom said to her son, “Daddy's home!” She clicked on an awful smile, and went to the front door. Mom gave a bright, forced laugh. Junior stared at the floor, and smiled with aching jaws. Junior walked to his father, and hugged him with labored arms. Junior looked into his father's face. It was a tight face, with hard, sharp cheekbones. His father's eyes were dark and deep-set, and down in that darkness there was a rage coiled up and waiting. It flew out without warning, but most of the time it lay inside Dad's head and simmered in its stew of perpetual jokes and gritted-teeth smiles. Where that rage had been born, and why, Junior did not know, and he figured his father didn't know either. But jokes were its armor and weapons, and Dad wore them like metal spikes. Mom turned away and walked into the kitchen to put three turkey TV dinners in the oven. Then Dad began his weekly inspection of the house—a wandering from room to room as he spouted off jokes and comments he considered funny, punctuated by the opening of drawers and cabinets. The rest of the evening would be spent with John in front of the TV set, watching the sitcoms and scribbling down on his yellow pad jokes and repartee that particularly caught his interest. Grist for the grin mill, he called it. Sometimes between the third and fourth comedy show of the night, Junior opened a door and went down the stairs to the dirt-floored basement. He switched on the light bulb, picked up a flashlight, which was always in its proper place, and went to the far corner at the rear of the basement. He lifted a cardboard box and watched roaches scurry in the flashlight's beam. The ants were swarming. They'd done a good job. The chipmunk was almost down to the bones, and most of the kitten's bones were showing now, too. It wouldn't be too much longer. But Junior was impatient for his toys. The basement was very damp, the walls mildewed. He wondered if he'd have skeletons faster if he put the dead things in a dryer place. He lifted a second box, looking at his newest acquisitions. He'd found the dead bat in the abandoned house near the church three blocks away, and the robin had been snatched from a cat's jaws just yesterday. They weren't going to smell very good soon. The smell would rise into the house, as the beautiful summer days got hotter. Junior had been wanting to kill a full-grown dog or cat and watch its skeleton come out, but that smell would get up into the house for sure and his mother might come down here and find everything. His father he didn't worry much about; nothing pulled his father away from the comedies and the yellow joke pad. But if he was going to start finding bigger playthings, maybe he needed somewhere else to keep them. At nine-forty, Junior was sitting in the living room watching his father snore in his easy chair. His mother was on the telephone in the kitchen, talking to her friend Linda Shapona, who lived a few streets over. They'd gone to high school together, and Linda owned the beauty shop on Kerredge Avenue. Mom was usually on the telephone most of the evening; it was her only route of escape. The television was on, the last of the night's comedies. The yellow pad had slipped to the floor, and Junior picked it up to see what his father had written there. It was hard to read the writing. The pen had attacked the paper. Junior could only make out a few of the mass of scribbled jokes and puns, the writing running together and overlapping like a nest of thorns. Boss. A big noise in the office, but at home a little squeak. What's a diplomat's favorite color? Plaid. Heaven's where God pays all the bills. A father always no's best. Middle age is the time in life when a girl you smile at thinks you know her. “Yes, sir.” Junior put the yellow pad down beside his father's chair. His father stretched, and his joints popped. Junior suddenly tensed, because he heard the sound of a car's engine racketing. Dad stared at the front door, as if he expected Eddie Connors's red Chevy to come roaring up the porch steps and into the house. Eddie revved the engine a few times, getting ready to lay rubber on the street right in front of the house—and then the car began to pop and sputter, and after a few seconds of that the engine died. Junior nodded. Eddie Connors wasn't going to be tearing the street up tonight. Dad was looking at his son. They stared at each other, their faces similar constructions of flesh and bone. The people in the situation comedy prattled on, and the canned laughter filled the room. “You're my boy, aren't you?” Dad asked. His father leaned toward him. Closer. And closer still. Junior could see pinpricks of sweat glistening on his father's cheeks and forehead. His father's skin had a sour smell, and the man's eyes were like black glass. “Junior?” his father whispered. “I want to tell you a secret. Know what a secret is? It's anything a woman doesn't know. But I want to tell you, because you're my boy.” His father's face floated before him in the dim light, half of it in shadow like a waning moon. “I'm afraid,” Dad whispered. Junior didn't speak. A small vein was beating very hard at his right temple, and his lips were bloodless. Junior didn't move. He could hear his mother, talking on the telephone. He thought of the toys in the basement, slowly being whittled down to the bones by ants and roaches, a little more hour after hour. “No, sir,” Junior said, lifelessly, but in his chest his heart was pounding. Junior stopped. Terror had crippled him. Those words were not said very often, but Junior understood them. He looked at his mother, who seemed to have diminished in size, her skin turned a sickly gray. “Yes, sir,” the boy answered, and he went to his room and locked the door. Then he lay in bed and stared at the ceiling, where cracks riddled the plaster. In the morning, he could pretend he had had a particularly terrible nightmare. He could pretend he had not heard, as the clock's hands crept past midnight, the muffled noise of his father's voice beyond the wall, speaking stridently—commanding—and his mother's weak begging. He could pretend he had not heard his father shouting for her to laugh, to laugh, to fill the house with laughter. To laugh and laugh until she screamed. And there was the slapping noise of the belt and a lamp going over and the bed creaking savagely and his mother's sobbing in the silence that followed afterward. His teeth gritted in a rictus, he lay with night pressing in on the house and darkness coiled within. When he got out of bed, the sun was shining again. His father was gone, and so was the briefcase and the yellow pad. His mother made him breakfast. She had a split lip, but most of her bruises never showed. She smiled and laughed, a brittle sound, as she moved around the kitchen, and when she asked Junior what he was going to do today he said he had plans. He left home early, bound for the secret place. He passed Eddie Connors's red Chevy, a deballed stallion at the curb. It would take more than a wrench to get the fuel line unclogged. He continued along the street where sunlight and shadows intermingled, and he went his way alone. Atop the water tower on the high hill, Junior stood staring toward the spires of Gotham City. The chimneys of the factories were pumping out smoke, the arteries were clogged with traffic, and life went on whether your old man was crazy or not. Junior opened the tower's hatch, and that was when he heard the voice. Junior felt his eyes narrow. Felt his face tighten, around the bones of his father. Felt rage open inside him like the unfolding of a dark flower, and black seeds spewed forth. Junior trembled. It was a quick trembling, over and done with, but it was like an inner earthquake and left cracks in his foundation. The secret place had been found. His haven of solitude was no longer his. And what did he own on this earth, except the toys that were stored within? “What're you doin' up there?” Wally called. “Maybe I can come up halfway,” Wally said, and he started up the ladder. They might get the wrong idea. They might think he was like his father. They might want him to go to that hospital where his father had gone, and where his father would be returning to soon. They might think something was wrong with him, and that something had been wrong with him for a long time but he'd been very good at hiding it. Wally reached the top of the tank. There was sweat on his face, and his glasses had slid down to the end of his nose. He was shaking as he got off the ladder and stood up. “There's a good view of Gotham City from here. See?” Junior pointed. Wally turned to look at the city. “Wow,” he said, his back to Junior. Drag Wally into the bushes. Hide him. Who was Wally, anyway? He was a little nothing, and he should never have sneaked up here to the secret place. One push, and the secret would be a secret again. But Junior didn't move, and then Wally turned around again and saw the open hatch. “What's in there?” he asked. And it all came clear to Junior, what should be done, like a burst of brilliant light in his brain. “Want to see?” Junior asked, smiling. He was cold, even standing in the sunshine, and he trembled though he could feel sweat on his back. “Yeah.” Wally nodded, but he was looking at the open hatch. “Follow me down,” Junior said, and he slid into the hatch and descended the ladder. Wires dangled from pipes overhead, and from those wires hung the bones. There were over a hundred. Constructions of wire and small skeletons—birds, kittens, puppies, chipmunks, squirrels, lizards, mice, snakes and rats. Junior had not killed all of them himself; most of the carcasses he'd found, on his long solitary treks. He'd only killed maybe forty of them, the kittens, puppies, and some birds with broken wings. But the skeletons had been reformed, with wire and patience, into bizarre new shapes that did not resemble anything that had ever lived. There were birds with the skulls of kittens, and kittens with wings. There were comminglings of rats and puppies, squirrels with beaks, and other things with eight legs and three heads and ribcages melded together like strange Siamese twins. There were things freakish and hellish, constructed from Junior's imagination. And here, on these wires, was the result of the only thing that excited Junior and made him truly smile: Death. “I... think... I'd better go home,” Wally said, and he sounded choked. “You like me, don't you?” Junior asked, as he moved the light from monster to monster. He let Wally go, and he picked up the hammer that lay near the bottom of the ladder, next to the coil of wire, the wire-cutters and glue and the can of Rust-Eater. Wally was pulling himself up on the first rung of the ladder, but Junior grinned and swung the hammer and as the hammer crunched into the back of Wally Manfred's skull, Junior was filled with a blaze of joy. Wally gave a little cry, and he fell backward off the ladder. In the wind of his passage, the freakish skeletons danced. Wally tried to get up to his knees on the floor, and Junior watched him struggle for a moment. The red was coming out of Wally's head. Junior thought of his father, scribbling fevered jokes on the yellow pad. He thought of his mother, and how she sobbed through the wall on the nights when Junior locked his door. Wally was mewing, like a wounded kitten. “Know what a laugh is?” Junior asked. He hit Wally with the hammer again, in the back of the head. Again. And again. Wally was on his stomach and he was making no noise. Junior lifted the clotted hammer to strike Wally Manfred once more, but he stopped himself. There was no use breaking the skull anymore. Junior sat down beside the corpse, making sure not to get any blood on his clothes. He listened to the rustling of his toys overhead. The secret place was a secret again, and all was right with the world. After a while, he prodded dead Wally with the hammer. Poked him all over, seeing how much meat there was on the bones. Wally was a skinny kid. It wouldn't be long. Wally had never known he was a walking Erector Set, with so many different neat parts. Junior switched off the flashlight and he smiled in the darkness. He left the hammer in its proper place. Atop the tank, he sealed the hatch good and tight. Maybe he'd come back in a month and see how things were going. It would be like opening a Christmas present, wouldn't it? Junior stood up and stared toward Gotham City with dark, hollowed-out eyes. The chemical factory's chimneys were spouting a mixture of white, reddish-brown, and pale green smoke. The haze filmed the sky between him and Gotham's towers, and it shimmered like a mystery on this beautiful summer's day. Junior descended the ladder to the earth and started walking home through the woods. The replay of a hammer striking flesh reeled itself over and over in his brain, and it got better every time. On the way home, he came up with a joke of his own that he'd have to tell his father: Why is a dead person like an old house? 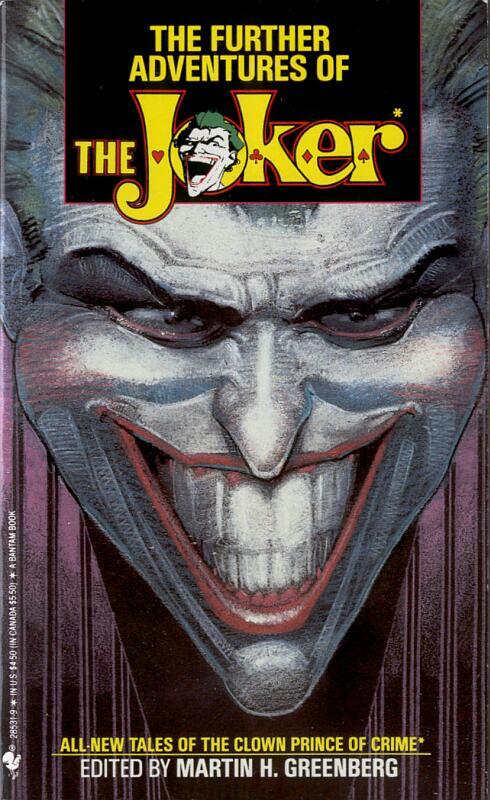 Copyright © 1990 by Robert R. McCammon. All rights reserved. 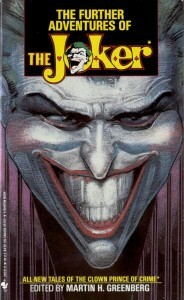 This story originally appeared in the anthology The Further Adventures of the Joker, first published in 1990. Reprinted with permission of the author.